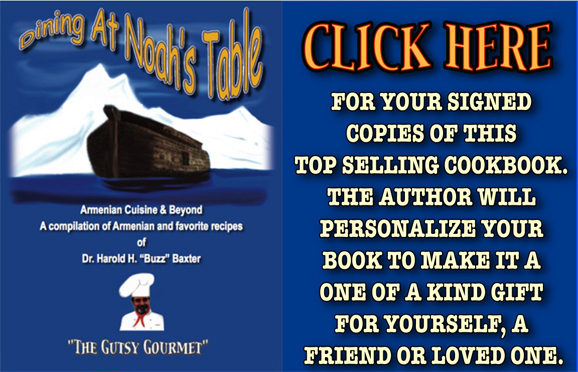 GET YOURSELF A COPY OF THE MOST BEAUTIFUL ARMENIAN COOKBOOK AROUND! JAM PACKED WITH HISTORY, FULL COLOR PHOTOGRAPHS, AND INTERESTING ANECDOTES - A REAL KEEPER! A CULTURAL, FIRST EDITION. A MUST GIFT FROM EVERY ARMENIAN PARENT TO THEIR CHILDREN! I NOW HAVE NEW BOOKS ON HAND, READY FOR SIGNING! By phone at 1-888-795-4274, by email: at orders@xlibris.com or by fax: at 610-915-0294.